Luis Suarez took centre stage as Liverpool and Everton shared the points after a pulsating 90 minutes in the 219th Merseyside derby. The Uruguayan was controversially denied an injury-time winner after Everton had fought back from 2-0 down, but it was an earlier goal celebration which is likely to prove the game's enduring image. Having played a key role in Liverpool's opener with a shot that deflected in off Leighton Baines, Suarez ran to celebrate with a swallow dive in front of David Moyes - a reference to claims by the Everton manager before the game that he went down too easily. Suarez added Liverpool's second with a deft header four minutes later only for Everton to score twice before half-time through Leon Osman and Steven Naismith. 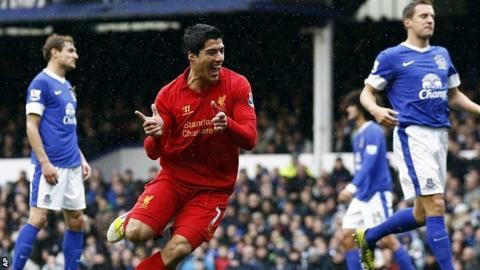 The result leaves Everton in fifth and extends Liverpool's unbeaten run to four matches. At the final whistle, they could give no more. Everton and Liverpool had fought each other to a standstill, matching each other step for step and, ultimately, goal for goal. If the clocks had not quite gone back 25 years to the days when Peter Reid and Steve McMahon slugged it out in midfield, Steven Gerrard and Marouane Fellaini, an adopted Scouser, still refused to give each other the time to exhibit their playmaking skills. Much of the talk before the game had centred on Everton's best start to a Premier League campaign since they qualified for the Champions League places in 2004-05, but Moyes had made the headlines by claiming Suarez consistently went down too easily. "Some other European leagues have all the culture of a theme park. I prefer the Premier League - it's like a dangerous fairground ride." In the 14th minute, the Reds striker pounced on a loose ball to the right of the Everton penalty box and sent in a low shot that deflected in at the near post off Baines's leg. Suarez turned for the dugouts to celebrate, pointing in Moyes's direction before throwing himself into the air in a swallow dive and landing on the touchline in front of the Everton manager. The Scot stormed out of his seat and a number of items were thrown on to the field in the minutes after the goal, but more drama was to come. Five minutes later, Suarez scored a second Liverpool goal. Sterling won a disputed free-kick, Gerrard curled a delightful ball onto the head of his striker and Suarez applied the glancing blow that took the ball beyond Blues keeper Tim Howard into the net. The celebration was more traditional this time but Goodison was stunned. The home support had no time to catch its breath, however, as Everton surged forward driven on by their manager. Nikica Jelavic combined with Fellaini to win a corner, and Brad Jones could only punch it to the edge of his penalty area where Osman thumped it back across the Liverpool goalkeeper and into the net. Everton drew hope, and with it purpose and penetration, as Phil Neville and Osman started to dominate the midfield battle. Kevin Mirallas was tormenting Andre Wisdom down the Everton left, creating one chance for Fellaini and another for himself as Goodison now bounced with optimism. It was no surprise when the equaliser arrived shortly after the half-hour. Mirallas surged forward again, but his cross hit Fellaini. The Belgian gathered the loose ball and sent another cross into the middle where Naismith arrived to score his first goal for Everton. Liverpool were being overrun and Rodgers required a major reshuffle at the break. A switch to three at the back allowed his side the spare man in midfield but it was the decision to thrust Sterling into a central attacking role alongside Suarez that caused Everton a bigger problem. Suarez has attempted more shots at goal (44) than any other player this season. Suarez's last five goals in the Premier League have all come away from home. The 17-year-old's pace was an immediate issue, as he broke beyond Phil Jagielka only to skew his shot wide with just Howard to beat. But Everton kept coming too. Fellaini headed wide and Jelavic came within a big toe of an Everton third as he stretched to reach Seamus Coleman's low cross, before inexplicably heading Baines's free kick-wide from six yards. Suarez was never far from the action in his role as pantomime villain, receiving a booking for treading on the back of Sylvain Distin's leg. Liverpool came again and thought they had snatched a winner when Gerrard's free-kick was headed down by Sebastian Coates and prodded in by Suarez. The red half of Merseyside began to celebrate but the linesman's flag was raised, replays showed incorrectly, and the points were shared.